Living off campus is a great experience many University of Akron students decide to include in their college experience. Calling an off-campus apartment home is great for getting more space, but also requires a little bit more responsibility than dorm living. To help you adjust to off-campus life, we compiled a list of the top 13 off-campus living essentials you should have in your University of Akron Student Housing to make life easier for you and your roommates. With all the extra space an apartment has to offer, cleaning items are a must for your University of Akron student housing. While how much you clean, is ultimately something you and your roommate will have to agree upon, there are some basic items that you should make sure to include in your packing list. We recommend coordinating with your roommates on bringing a vacuum to your apartments, after all, you won’t need more than one in your apartment. While in a dorm you and your roommate probably shared one room, an apartment like University Edge gives you a common space, one bedroom and bathroom per resident, a pantry, and laundry area. Many of our residents love the extra space, but that means extra space to clean, which is where the vacuum comes in handy! We also suggest having plenty of sponges on hand to help clean the kitchen and bathroom area. Living off campus means you’ll be cooking more in the kitchen and fewer meals on campus. 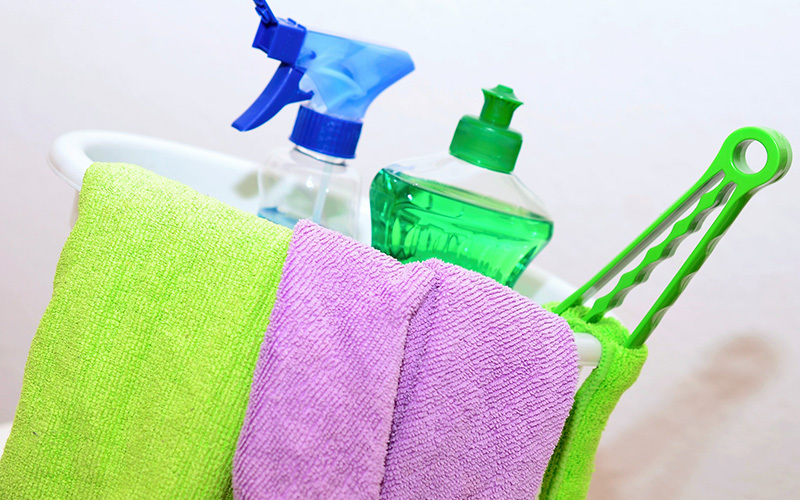 Be prepared to clean up afterward with sponges stocked up in your apartment. Last but not least don’t forget to be stocked up on shower cleaner for your apartment. Everyone in your apartment will get their bathroom attached to their bedroom, meaning there can be anywhere from 2 to 4 showers in your apartment depending on the floor plan you choose. With that many showers, it’s easy to see why shower cleaner is an essential for your off-campus apartment. As we mentioned earlier, part of your Akron off-campus apartment floor plan includes a kitchen for you and your roommates to share. Don’t forget to pack these essential kitchen items for your apartment. Make sure to bring plenty of Tupperware to help you keep any leftovers or easily take food to your class or internship. Besides, all the cleaning you’ll also need to make sure you have a garbage can in your apartment. Easily take out the trash down the hall. Another item to coordinate with your roommates, unless you want to have three toasters in your off-campus apartment. Adding a toaster to your kitchen will make it easier to have breakfast on the go and create other basic meals. You’ll also want to coordinate with your roommates about a can opener so you can bring canned soups and vegetables in your pantry for quick meals. Don’t jinx yourself! Make sure to have a plunger on hand in your apartment, just in case. Another item you shouldn’t forget is a bath mat to catch any excess water after your shower. You’ll want to get one for your bathroom to ensure you don’t slip. You probably needed one or two of these in your dorm room, but make sure not to forget a laundry basket for your apartment. Laundry will be easier though in the new apartment because you won’t even have to walk down the hall to get your laundry done. Last but not least, don’t forget to have a flashlight on hand, again for those just in case moments. Still looking for an off-campus apartment to call home next semester? Schedule a tour of our apartments and see why many University of Akron students enjoy calling us their home away from home.